Clematis triternata 'Rubromarginata' freely produces lovely, starry, scented flowers which are white, veined and edged with reddish-purple with creamy green centres from July to September. 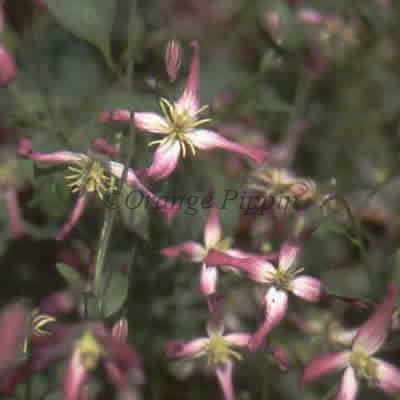 Clematis triternata 'Rubromarginata' was believed to have been raised by Thomas Cripps and Son of Tunbridge Wells, England. Some attribute it to George Jackman and Son, England. This highly attractive, non-evergreen climber can be grown against a trellis, garden fence, wall, arches, pillars, pergolas, clambering over tree stumps or through large shrubs in the flower border.